How I can get the character of 1/2, 1/4, and 3/4 the same way I can write an é, ñ, ç, ü, µ, œ, ‰, et al. with my keyboard? Launch System Preferences, select the Language & Text preference, and then the Input Sources tab. Enable the Keyboard & Character Viewer option. While you’re there, make sure the Show Input Menu in Menu Bar option at the bottom of the window is also selected. Close the window. Now, when you’re in a document where you wish to insert a “real” fraction rather than something like 1/2, choose Show Character Viewer from the Input icon in the menu bar (the menu represented by a flag). 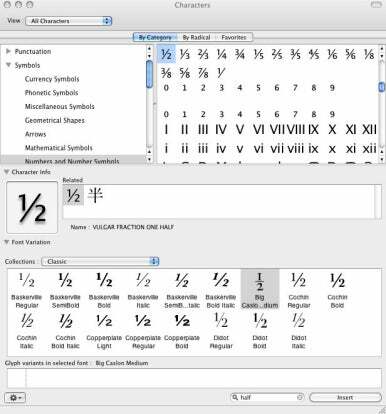 In the Search field at the bottom of the resulting Characters window type out the name of the fraction you’re looking for—half, quarter, or eighth, for example. A list will appear that features all entries that match your query. For example, if you type “eighth” you will see ⅛, ⅜, ⅝, and ⅞. To insert one, just double-click on it or select it and click the Insert button at the bottom of the window.